U.S. Class 8 retail sales in September reached 23,648, the second-highest total of the year, WardsAuto.com reported. It was a sign that persistent supply chain woes had loosened enough for truck makers to bring down a backlog of partially built trucks and send them off to fleets and dealers, analysts said. Sales rose 33.9% compared with 17,667 a year earlier, according to Ward’s. For the first nine months, sales hit 178,199 — an increase of 32.5% from 134,481 in the 2017 period. While the year-over-year comparison is one indicator of demand for trucks, analysts found two other measures that also underscored September’s strength. ACT Research Co. Vice President Steve Tam went straight to seasonal comparisons. “We normally see September drop [sequentially] about 10 percentage points. So the fact that it only dropped 1 percentage point is a testament to the ongoing strength of the market,” he said, referring to the decline from sales of 23,913 in August. September’s sales also occurred on just 19 weekday selling days compared with 23 in August, said Don Ake, vice president of commercial vehicles for research firm FTR. Tam agreed that manufacturers are making progress on reducing their incomplete trucks. “My guess is we will continue to see that gap close,” he said. 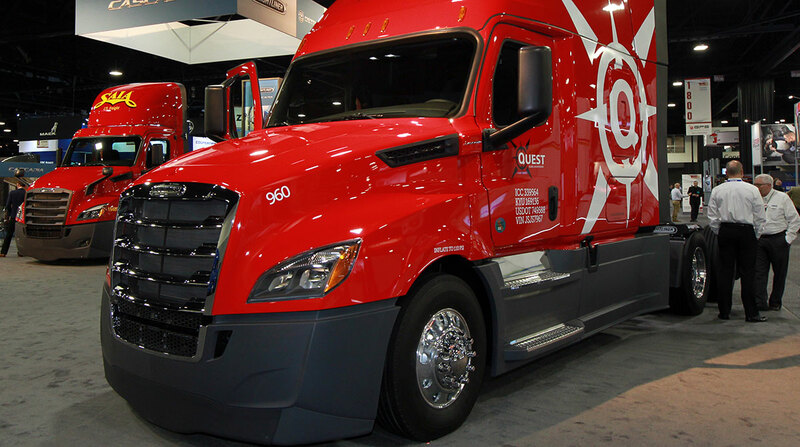 Freightliner, a unit of Daimler Trucks North America, sat atop the market in September with a 35.6% share after selling 8,415 heavy-duty trucks. DTNA niche brand Western Star had a 1.6% share on sales of 386. Three other truck makers each earned a market share of slightly more than 15%. Kenworth Truck Co. had a 15.6% share, selling 3,693 trucks. “Kenworth continues to build trucks at high build rates in order to support the high tonnage levels in the economy,” Kenworth Marketing Director Kurt Swihart said. Peterbilt Motors Co. earned a 15.4% share on sales of 3,638. Kenworth and Peterbilt are brands of Paccar Inc.
International Truck, a unit of Navistar Inc., pulled down a 15.4% share with sales of 3,643. Day cab sales are rising slightly, too, he said, although getting bodies on vocational models is a challenge. By some estimates, day cabs account for 43% of Class 8 sales. Meanwhile, Volvo Trucks North America sold 2,313 trucks for a 9.8% share. “Replacement and expansion cycles coupled with strong freight rates have created an environment that’s conducive for investing in new equipment that brings greater value through enhanced safety and greater uptime,” said VTNA Vice President of Marketing Magnus Koeck, and that has benefited sales of its new Volvo VNR, VNL and VNX series. Mack Trucks North America earned a 6.6% share on sales of 1,560 units. “We are now seeing the positive trend we anticipated as our backlog translates into retail truck sales,” said Jonathan Randall, senior vice president of sales for MTNA, which saw year-over-year sales jump 18.9%. VTNA and MTNA are units of Volvo Group. ACT forecasts U.S. Class 8 retail sales will total 254,100 this year and essentially be flat at 256,000 in 2019. Ake sees retail sales remaining strong through the rest of the year. Other truck makers did not respond to a request for comment.